NOTE: If you plan on using a Hopper 3 in your RV, then the only option is using a 1000.2 dish. 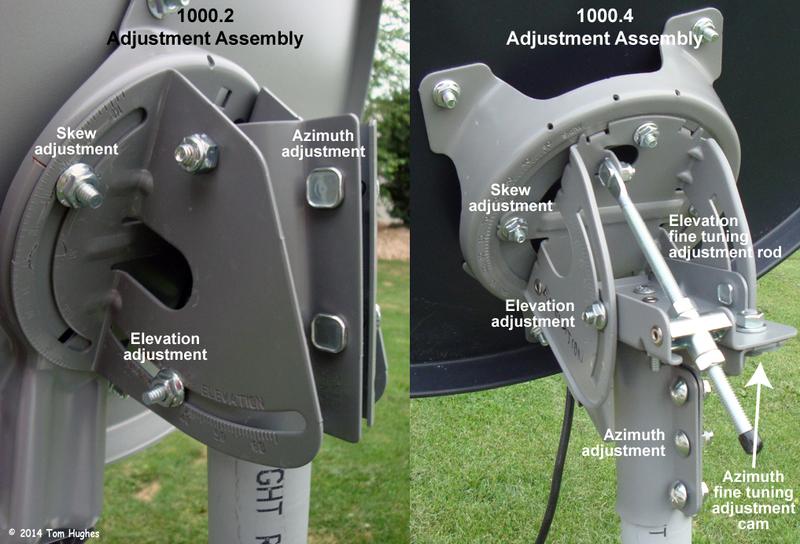 For DISH TV users, the two most commonly used 3-LNB open-face dishes are the 1000.2 and the 1000.4. A 1000.2 comes standard with Western Arc (satellites 110, 119, 129) LNBs and a 1000.4 with Eastern Arc (satellites 61.5, 72.7, 77) LNBs. However, both of these dishes can be configured for the Western Arc and the Eastern Arc satellites. Note that a 1000.2 set up with Eastern Arc LNBs will only receive sats 61.5 and 72.7. Need to up date the site Dish is not using the 77 sat it is for mainly hispanic and latino which some people don’t need. All the HD and Locals are on 61.5 and 72.7 and the installers switch out the older style head with the three LNBF’s to the newer 1000.2 dual feed which has larger scalers and is a better LNBF. the problem for most do it yourselfers like myself can’t fnd the skew angle it’s different than the Dish 500 and not the same as the 1000.4 Eastern Arc dishes. Us do it yourself duffers need a table like the point and aim charts depending on your location. help! You’re incorrect on both issues — 77W is not only used for network programming, but also for local stations for a number of cities. The 1000.2 one: 1000.2 EA LNB. I switched mine (1000.2) from western arc to eastern arc today. I used lmb 184187 twin eastern arc. The plastic yolk is used for both the eastern and western lmb. I needed to take the 1000.2 apart so that I could rotate it to the proper angles. Thank you for this; very helpful! Nice tripod and thanks for the link to it! What model number Solo Node is/are used for 1000.2 and 1000.4? Dish has discontinued the 1000.4 dish and replaced with a 1000.2 EA (Eastern Arc). Now there is a 1000.2 WA and a 1000.2 EA. Yes, technically DISH has discontinued the 1000.4. However, they’re still available on eBay, and some RVers (like me) prefer the 1000.4 vs 1000.2 as the former is built better. Just discovered this conversation today and have some questions. I pulled out a 1000.4 to bring to the east coast with me this summer which I purchased some years ago when out east and wasn’t able to see the Western Arc Sats where we were parked. I have the 1000.2 with me also. Is the 1000.4 truly discontinued? Is the LNB that came with my 1000.2 compatible with the 1000.4 when I go back west or need I obtain another? Would I be better off getting an eastern arc LNB to use with my 1000.2 (or is the one that came with my 1000.4 compatible? I much prefer the design of the 1000.4. Yes, the 1000.4 is “officially” discontinued by DISH. However, you can probably pick one up on eBay. No, the 1000.2 LNBs are not compatible with a 1000.4 dish. The 1000.4 has its own Eastern and Western Arc LNBs. If you can find a Western Arc LNB for your 1000.4 (eBay again), you’ll be fine. I, too, prefer the 1000.4, but have to use a 1000.2 now because the new “hybrid” LNBs only work on a 1000.2. So, let me get this straight, the .4 is usable for both WA and EA with no issues. Great, i like the .4 better. I have also found that a DTV SWM dish can be modified to work with DISH. Have you tried that configuration? 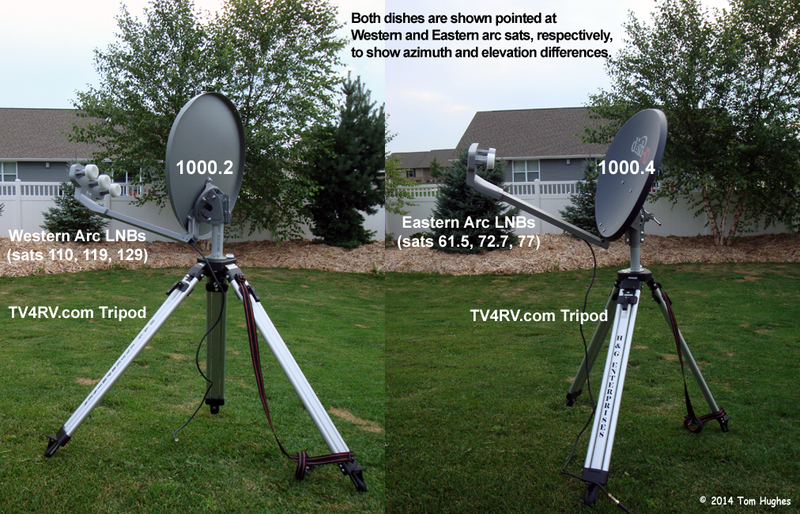 Both the DISH 1000.2 and 1000.4 can be modified for both arcs. Have not tried a SWM dish. How did you modify it? Can I use a hopper in my RV? Yep, many RVers simply take their home Hopper on the road when they RV. 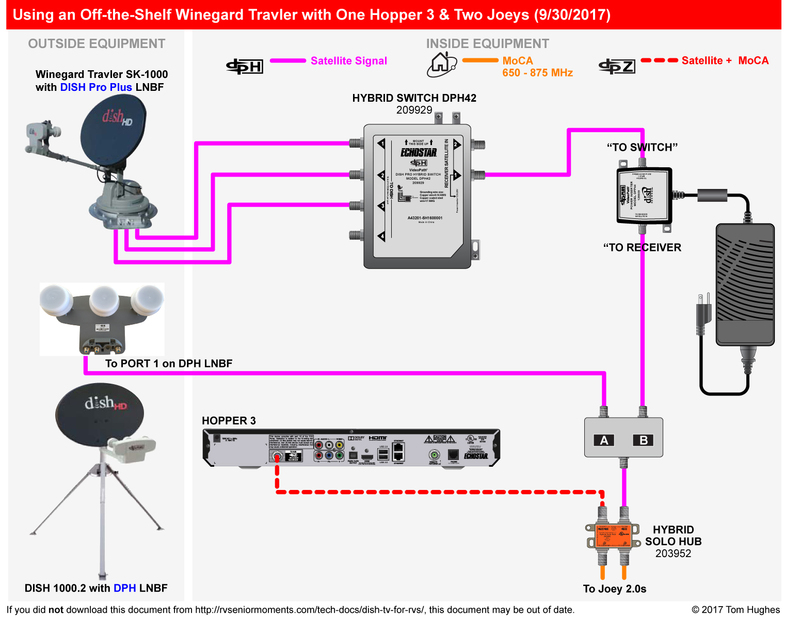 With the first two generation of Hoppers (Hopper & Hopper with Sling), you can use the standard Winegard Travler rooftop dish or a standard 1000.2 or 1000.4 portable dish. With the new Hopper 3, it’s a little more complicated. Dish Rep told me they do NOT recommend Hopper for RVs. I can just tell you my experience and other RVers — Hoppers work just fine in RVs, but suit yourself. Great stuff I am reading and trying to learn all I can as quickly as I can, but, I need some guidance. My motorhome was struck by lightning Aug 1. It took the chassis guys a month to fix it so I could drive it to Nappanee indiana (Newmar Factory) to service the coach problems. I had a Winegard Domed dish that is now “toast”. I believe it was the “companion” model? Anyway, one sat at a time and noisy as all get out. I want to upgrade the Dish to a trav’ler (multi sat) and would like to use some form of Hopper. However, I don’t want to void my new antenna warranty changing to the HYBRID LBNF. So I think I need a Hopper (2) with sling. Should I be ordering Winegard SF 1000.2 with EA or WA? Sri for the “newb” questions but I need to spec it by Tuesday September 13. Yes, to avoid voiding your warranty on a new Winegard Travler, opt for a Hopper w/Sling. It’s still a powerful DVR. For a portable (“Winegard SF”?) dish, get a standard 1000.2 which comes with a Western Arc LNBF. Then buy an Eastern Arc LNBF for the 1000.2 because you’ll never know when you need it. The Hopper 3 requires a Hybrid LNBF. While there are Hybrid LNBs (Western & Eastern arc) available for a 1000.2 dish, I don’t think they will work on a 1000.4 dish. I just ordered a dish turbo and have 2-211 receivers, will they work together or do i need a node , switch or? You connect a 211 directly to a 1000.2 or 1000.4 dish. Since these dishes have 3 outputs, you could attach up to 3 211s. I have a 1000.2 dish with the DPP EA used at my tailgate that worked with Hopper 2. We now have the Hopper 3 and couldn’t get it to work this weekend. Do all I need to do this is switch the LNB to the DPH EA? Such as this: http://www.ebay.com/itm/like/201591842249 ? Any help would be appreciated, thank you for your hard work on these pages.